The other day (2/18/13) at Hive Site 5 I noticed something that has me more than a little nervous. 1110 showed evidence of an unwanted tenant. I don’t know what happened over the course of the winter but 1110’s mouse guard moved out of position. There were tell-tale signs of mouse activity on the outside of the guard and the hive body. It is likely that a mouse has taken up residence in there. 1110 had less spotting than what 1203 on that visit. This is not what I would have expected given each relative hive’s activity last summer. 1110 was a boomer! If a mouse is in there it will greatly decrease 1110 chance of survival. A goal for 2014 is to make all hives mouse proof ALL THE TIME. I have been experimenting with some bottom boards that reduce the entrance to 5/16 of an inch for the last 2 years. I like them, but some of my old mentors have really turned their noses up at them believing that bees need that huge traditional rectangular opening during the summer. I have been wrong before…. but so have they. This calls for some experimentation. 1303 and 1306 were sporting these bottom boards last year and they did well. It is my OPINION that the use of 1″ holes like the one shown in 1306 as well as a top entrance will alleviate any traffic issues. I am going to hive all 14XX captures into this situation in 2014. I will find out if there are any traffic issues. There will be pictures and I posts about their progress. Does a reduced entrance in the summer make you nervous? What is your hypothesis on this experiment? 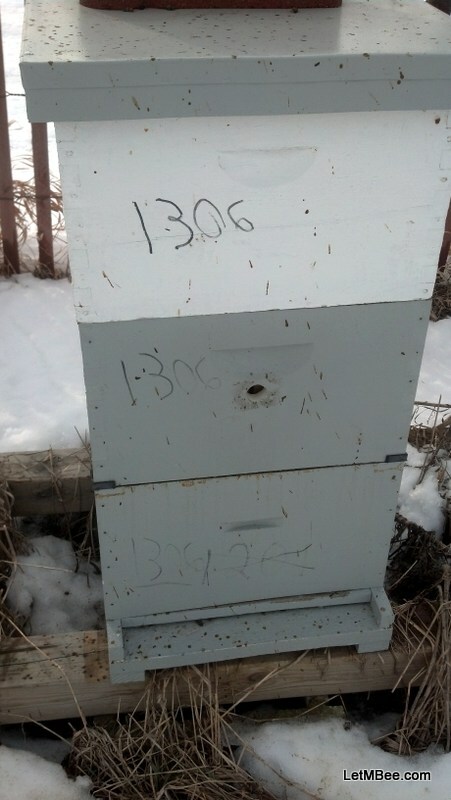 This entry was posted in Experiments, Hive Reports, Posts and tagged Indiana Beekeeping, mouse guard, treatment free beekeeping. Bookmark the permalink. I’m actually going to be conducting some experiments this year with a reduced hive entrance as well. I’ll be making a 1.25″ diam hole in the bottom box and closing off the big rectangular opening on some of my hives. You are experimenting!! !… That’s great. I will be tuning into the BeeVlog to see how things work out for you. I have been using the 1” holes for years. A lot of my used bee equipment had holes in them already when I got them. I have put the “holy deep” in several configurations, but I like to have a hole in the middle box of the 3 deep stack. 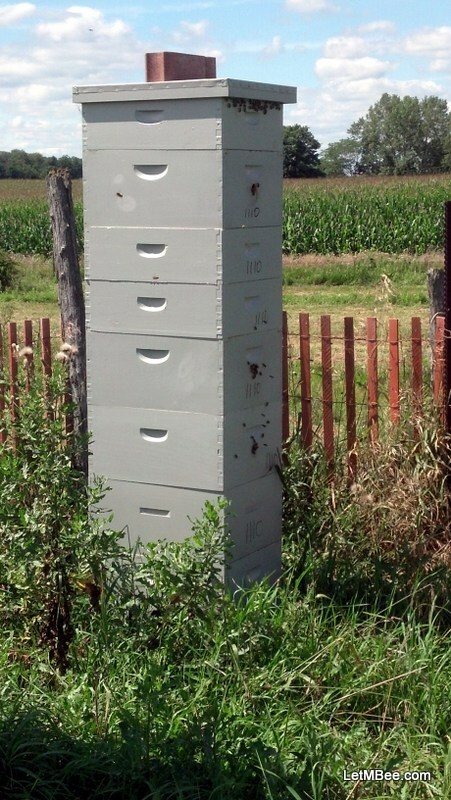 Most of the hives use the hole and the top entrance almost exclusively. I have taken video of their use, but it will take me forever to find them now. I will make a note of it and try to make that happen after we get moved. 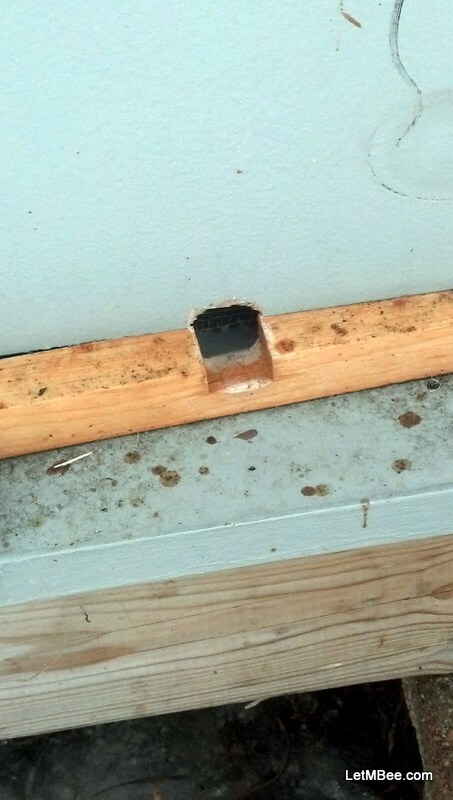 I was really drawn to the idea of using a hole when I used a box that had a left-over hole from a failed trap-out. They loved to use the hole and didn’t bother with the bottom board entrance. I think there may be something to it that the bees prefer. So I’m trying it on a few hives and will see how it goes. I did a couple other experiments last year. 1) Imirie shims. I’m not a big fan of them. The bees only guarded the opening or propolised it, and built a lot of burr comb. 2) Quilt boxes. Those worked very well. I noticed that the dead-outs with quilts had much less moisture and mold inside than the dead-outs without. I don’t understand Jason why a hole in the middle box and not the top box in your 3 box stack? As to the hole locations….. Previously throughout my yards I have had all different configurations which were based on what deep was available at the time of hiving. I was experimenting with different configurations last year to figure out if there was any difference in overwintering success based on where those holes were in the stack. I did TOP ONLY / TOP & MIDDLE / MIDDLE ONLY / MIDDLE & BOTTOM. With the conditions last winter I don’t know how good my data is going to be. While my established hives seem to be hanging in there pretty well (thus far) the swarms caught last year are not doing very well at all. I tried to expand to a new yard last year with all newly caught swarms and I think that venture was a total flop. I will be examining the dead-outs for comb construction this Spring so perhaps I will glean some insight from that, but I would rather have had the bees. As things come to light I will be posting them. I have used 5/16 inch entrances on several of my hives with no problems. I still staple a piece of 1/2 inch hardware cloth over the entrance for winter. I read somewhere that a mouse’s skull is flexible and can flatten to squeeze through a pretty small crack. Here is a link to a photo of the 5/16 inch entrance ready for winter. Here are links to photos of a homemade entrance insert I have used during winter in the past. The tunnel effect of the insert greatly reduces the wind entering the hive. Again, I staple a piece of 1/2 inch hardware cloth over the entrance for winter. I have sent you an email on a separate project I am working on.